Talking to your child or teen about online safety can seem like an overwhelming task and certainly is one of those things that is easy to put on the back burner. This day and age though it should be ranking at the top of our to do list. With stories in the news every day about kids lured by online predators or cyber-bullied until they turned to suicide, the importance of this topic is paramount. I’ll share with you how to talk to your child about online safety and actually get them to listen. It’s painless, I promise! One reason you may be putting off talking to your child about online safety is that you simply don’t know where to begin. Often our kids know more about technology than we do and it can leave us feeling a bit clueless. 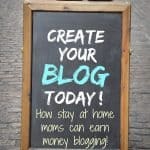 I’ll give you an easy road map to talk to your kids and get them to listen! 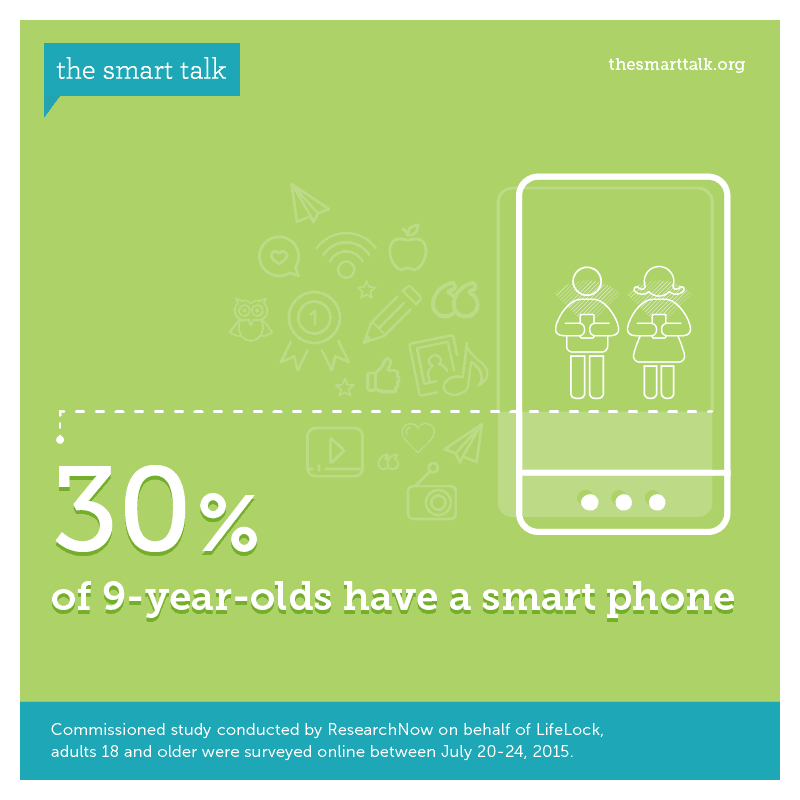 Did you know that 30% of 9 year olds have a smart phone?! That number seems crazy to me. As the mother of an 8 year old I can confidently telly you that she will NOT be getting a smart phone in the next year! What I can tell you is that schools use technology now so even if your young child isn’t getting access to it at home, they are getting access to it at school. They also will have friends that have smart phones. Even if you choose not to give your children their own smart phone, you can be assured that they will be exposed to it somewhere. Once kids hit the age of 12 over half will have a smart phone. 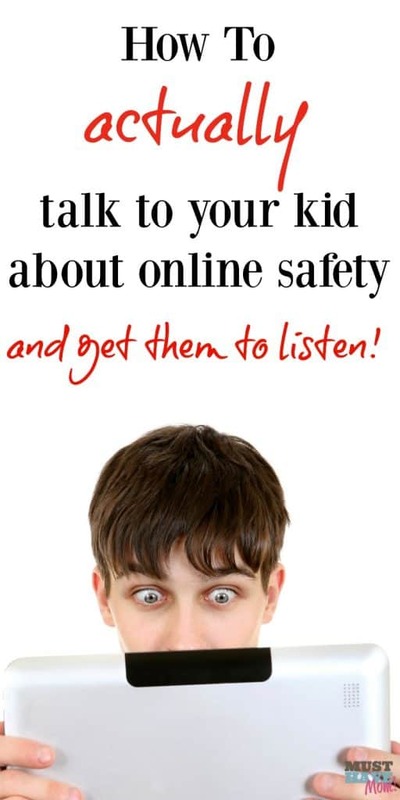 The sooner you talk to your kids about online safety, the better. 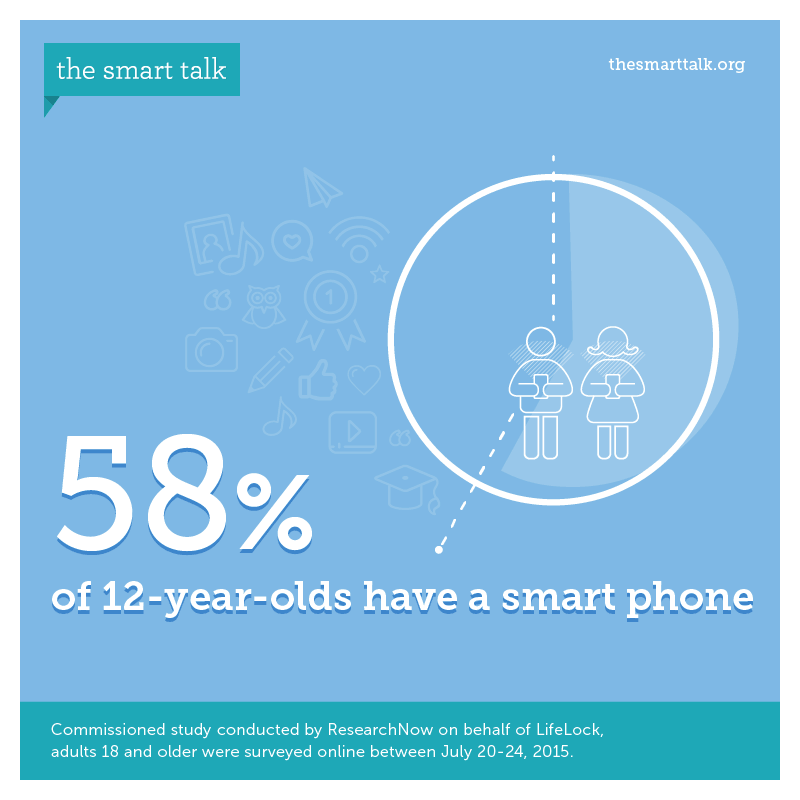 At 15 years old 80% of kids will have a smart phone. At this point you better make sure you have talked to your kids about online safety. How do you initialize a conversation about online safety and get your kids engaged in it? You want them to really listen and understand the dangers online right? Here is a helpful step-by-step plan on how to talk to your child about online safety! Put it in writing! Sit down together with your teen and create a plan you will put in writing. 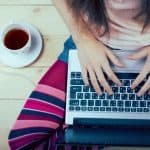 There is an awesome resource called Smart Talk that it totally free that will help you put it in writing for free! It’s a really neat tool and it makes the process of talking to your child about online safety an effortless process. First answer some questions to help set the ground rules. Here’s an excerpt of a family agreement that you can print off and keep in writing on display if you’d like to easily remind your child of the rules! Have your child sign and you also sign it. This is a good way to effectively lay out the ground rules for them. Often kids don’t realize that the decisions they are making are dangerous. If you can sit down and lay out that you don’t want your child to ever publicly post your address and explain to them why it isn’t safe then when the time comes that they need to decide whether or not to post their address, they can return to this conversation. I also love that the agreement lays out a specific number. Perhaps you have a data plan you don’t want exceeded. 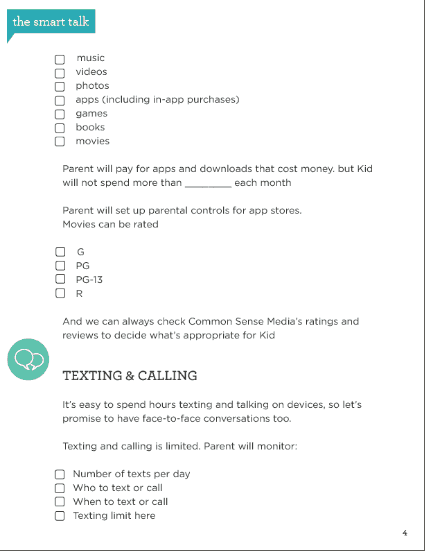 Lay out the number of texts per day your child is allowed to send. Don’t want your child using their phone between bedtime and morning? You can specify that in the agreement too. It really allows you to lay out a custom plan, between you and your child, that will help to not only lay ground rules, but also open up discussion. Use this time to explain the reasons for your rules and the safety concerns you have. Often teens feel invincible so be sure to explain real life situations that can happen to them. Still not sure where to start? 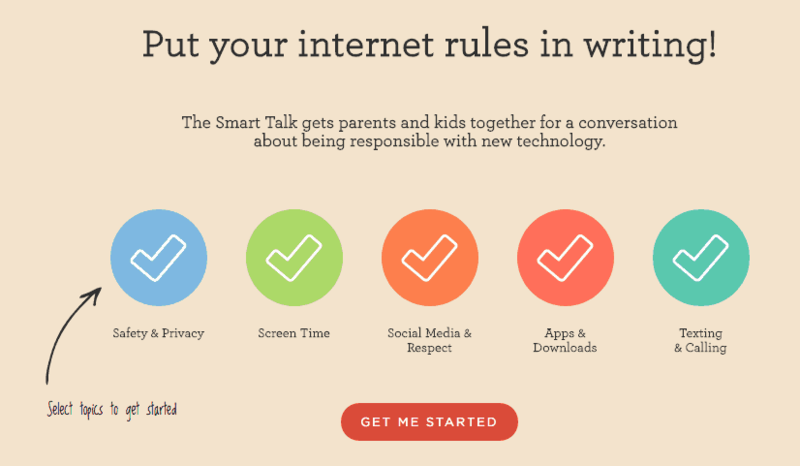 Learn how to talk to your child about online safety in the free Smart Talk quick guide and lay out a plan that will keep your child safe from online dangers. Don’t put off this discussion any longer! Take an hour of your day today to sit down and put a plan in writing! What rules have you established with your child to keep them safe online? 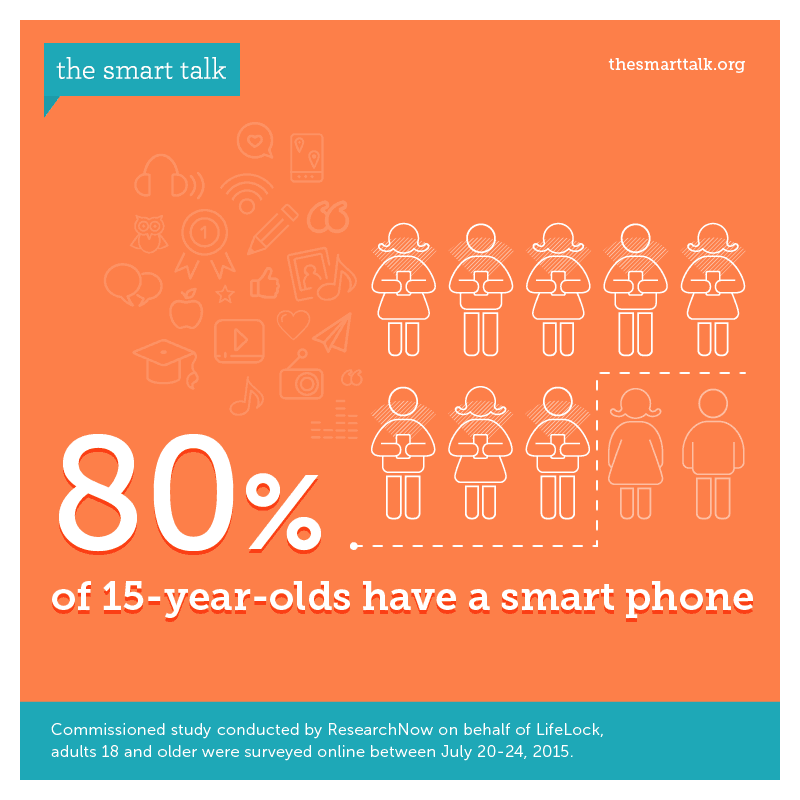 *Special thanks to Smart Talk and LifeLock for sponsoring this important message! « How To Determine What Breeds Your Dog Is Made Up Of! My oldest is 8 and won’t be getting a phon3 anytime soon. But when she does this is a great reference for laying down rules from the beginning. My kids have Kindle tablets and we have strict settings on them. As for phones, they do not get them until the pay have jobs..totally no need in our house. It is so important to talk about online safety. I love that internet agreement. It’s always good to have rules in writing for the kids to refer back to. My daughter is pretty good about listening to me. But you can never be to careful, so thanks for these tips! These are great ideas to think about. 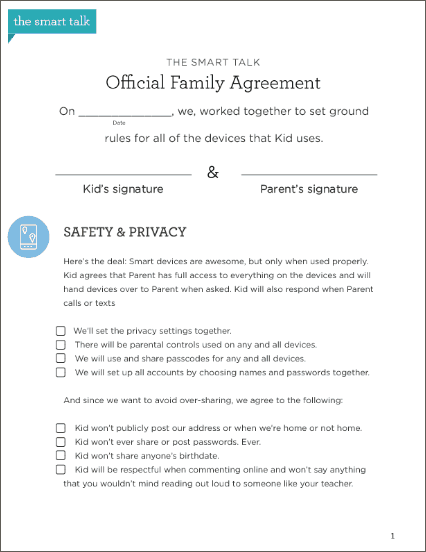 I like the family agreements you can print and use. They make the task seem much easier and makes me feel less likely to miss something important. Yes, it is a great way to make sure you cover all the bases and don’t miss anything. Communication is always the key. Let them know the dangers that they can fall into, it is ou job to warn them. I am always worried also my children what he does online, it’s now a very big problem, and it challenges for me! I learn from your article lot of things, thanks for sharing! You’re welcome Marina! I hope it helps keep your children safe online.